I made it out to San Juan Hot Springs yesterday. We got there around 9:00 AM crawled under a locked, barbwired gate. Then we headed for the Hot Springs. You can see the old San Juan Capistrano Hot Springs sign looks restored. We walked on an old dirt road till we saw some Palm trees on a hill and headed towards them.When we got closer you could smell the faint scent of sulphur. 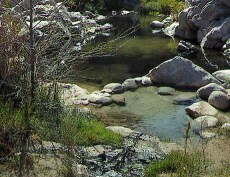 Then a short little singletrack trail crosses a hot, small stream. There are quite a few small pools with temperatures over 110F,we found one square tub with a cinder block lined edge that was 109....Perfect. Soaked there for an hour or so and headed back to the car to check out some waterfalls around the area. Cool spot on a cloudy day. Edited 1 time(s). Last edit at 04/05/2010 06:50PM by Madrox.